When wine people say that New York’s bottlings are overlooked, they’re usually referring to those made on Long Island or near the Finger Lakes—the state’s actual wine regions. They’re not talking about New York City, but soon they might have reason to, thanks to a Kickstarter from Rooftop Reds. Founder Devin Shomaker, a self-proclaimed city boy, doesn’t just want urban dwellers to drink wine—he wants them to be able to make it. The plan isn’t as crazy as it sounds. Urban rooftop gardens have proliferated in recent years. In a place where outdoor space is sparse and soil quality is pretty bad, you can now find farms on the roofs of schools, restaurants and brownstones. So why not a vineyard? Back in 2013, Shomaker lugged 50 plants onto on his brother’s roof in Windsor Terrace, Brooklyn. The plan was to see what would grow, and what grew were enough Merlot, Cabernet Sauvignon, Cabernet Franc, Malbec and Petit Verdot grapes to show that a rooftop vineyard was a real option. If they raise $15,000 (and they are close, people!) 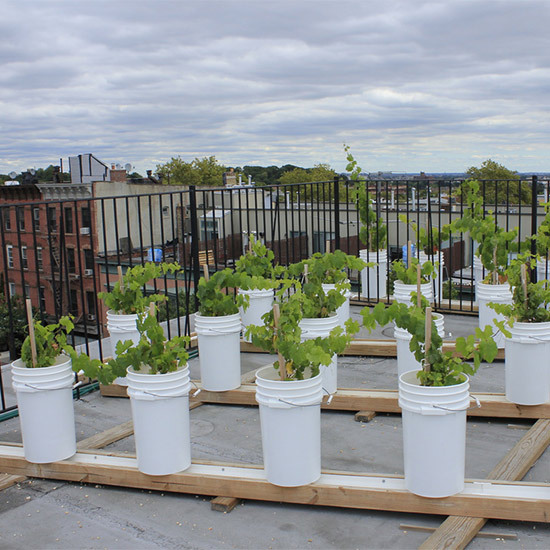 Rooftop Reds will be able to set up half an acre of vines—that’s 250—at the Brooklyn Navy Yard. The Yard is already home to the world’s largest rooftop farm from Brooklyn Grange, which has been working with Shomaker to create his vineyard. (So far, he’s been paying them exclusively in wine.) After this foundation is in place, Devin has plans for another 1,000 vines—enough to take Rooftop Reds from fun startup to commercially viable vineyard. When harvest arrives in 2016, Devin will use Red Hook Winery’s facilities to produce perhaps the first entirely urban vintage ever.